Six Palestinians wanted by Israel will be moved in the coming days to a prison in the West Bank town of Jericho, a Palestinian official said Monday, revealing the first details of a deal that would end Yasser Arafat's confinement. 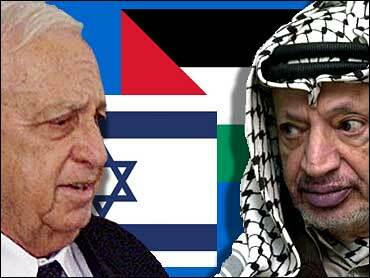 The deal to free Arafat, proposed by President Bush, was approved by Israel's Cabinet and Arafat on Sunday. The move of the six men from the Palestinian leader's besieged compound in the West Bank town of Ramallah to Jericho will take place within the next day or two, said Palestinian Information Minister Yasser Abed Rabbo. In Jericho, the detainees from Ramallah would be guarded by U.S. and British wardens. As soon as the six have left Arafat's headquarters, the Palestinian leader will be free to move, Abed Rabbo said. Four of the six were convicted last week by a makeshift court in Arafat's compound of involvement in the October assassination of Israeli Tourism Minister Rehavam Zeevi. The four, members of a radical PLO faction, the Popular Front for the Liberation of Palestine, were given prison terms ranging from one to 18 years. The other two detainees are the leader of the PFLP, Ahmed Saadat, and Fuad Shobaki, a senior Arafat aide suspected of involvement in a large arms shipment intercepted by Israel earlier this year. Meanwhile, a Palestinian militant holed up in Bethlehem's Church of the Nativity said 15 civilians would leave the church on Monday. The militant said he and some 30 others wanted by Israel might agree to be exiled to end the 26-day-old impasse. “We will commit to any decisions taken by the President (Yasser Arafat) no matter how difficult they are,” the militant, who asked not to be identified, spoke by telephone from the church. Thirty Palestinian fighters wanted by Israel burst into the Church of the Nativity on April 2 to hide from Israeli troops who had reoccupied the West Bank city in a sweep for militants. Israel has said it will besiege the church compound, one of Christianity's holiest sites, until the gunmen surrender to face trial in Israel or be exiled. An Israeli soldier shot dead one of the holdouts at the church on Monday, the Israeli army said. Progress on releasing Arafat and at the Church of the Nativity did not mean an end to other violence. Dozens of Israeli tanks backed by helicopter gunships swept into the divided West Bank city of Hebron early on Monday, killing seven people, witnesses and Palestinian security sources said. The Israeli army said it was searching for suspects, arms and explosives in Hebron following Palestinian attacks launched from the city such as one which killed four Israelis, including a five-year-old girl at a nearby Jewish settlement on Saturday. But there was no intent to undermine Yasser Arafat's Palestinian Authority, the army said in a statement. In another development, a frustrated U.N. Secretary-General Kofi Annan had one more day Monday to resolve an impasse with Israel over his much-delayed fact-finding mission into an Israeli assault on the Jenin refugee camp. Annan hoped to overcome the latest set of Israeli objections to the mission's ground rules after the Israeli cabinet said Sunday that conditions were “not yet right” for the mission team to head to the region that day, as planned. It was the third such delay sought by Israel since Annan announced the mission April 19 after Israel welcomed it. The mission team, meanwhile, remained on hold in Geneva, awaiting a green light from headquarters. Palestinians charge a massacre took place in the West Bank camp, with an unknown number of civilians killed. Israel denies this, saying it lost 23 soldiers while at the most 50 Palestinian fighters and civilians were killed. Jenin was the scene of the fiercest fighting in Israel's West Bank offensive, which began March 29 after a wave of Palestinian suicide bombings.